I wanted to post this on Thursday but life got in the way. I have a sick kiddo. Trip to the nurse practitioner said Pneumonia. Her breathing was very labored Friday night so we took her to the ER. They did a chest x-ray and gave her a breathing treatment. The x-ray was clear (thank goodness!) and the breathing treatment made it so much easier for her to move some air. She has bronchitis and was sent home with some antibiotics and an inhaler. Anyway through all this (and still going to school this week) I have been exhausted and unable to get things done that I really wanted to. 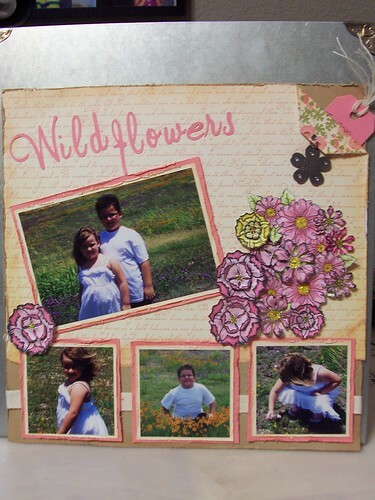 The layout I have to share with you today is our wildflower layout. Normally we take bluebonnet pictures but there wasn't enough rain for bluebonnets. 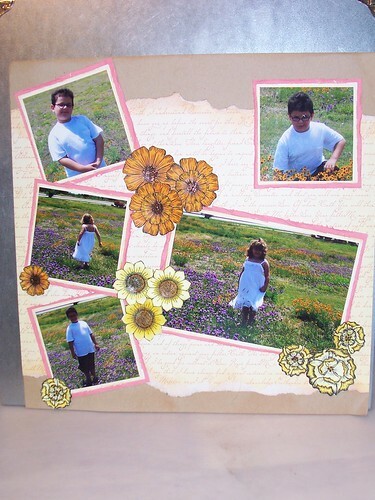 I created the flowers with Heartfelt Creations stamps and matching Spellbinders dies. I started by coloring the flowers with Spectrum Noir markers. I purchased several sets of their markers before Felicia's Scrapbooks closed at the end of November. I have been practicing and trying to improve my coloring techniques. 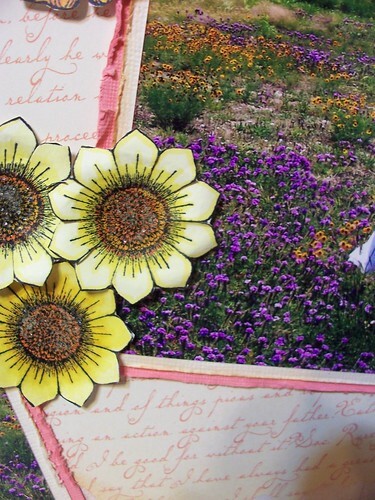 The nice thing about the Heartfelt Creations stamps and matching dies is that it is so easy to create beautiful flowers in a couple of steps. 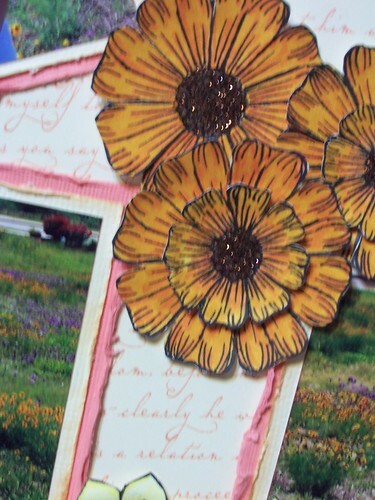 I cut the flower out of white cardstock and then lined up the stamp and added the details. After I colored the flowers I used my flower shaping tools and mat to add more dimension to the flowers. 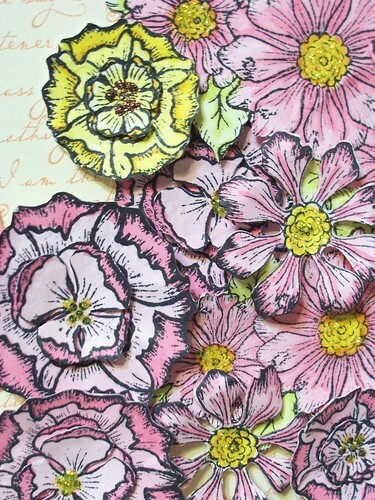 I finished the flowers off by add Stickles and Distress Stickles to the flower centers. 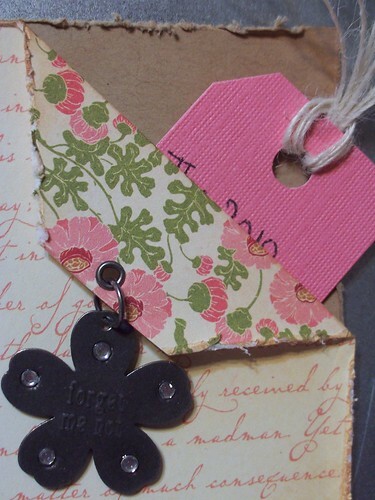 I also added some journaling on a tag in a corner pocket. Hopefully I will be able to spend a little more time in my craft room and post some new projects on my blog. I have been trying to find a balance between the needs of the classroom, the needs of my family and my own personal need to create!